This is a great cheek stain and lip stain, it’s a deep red colour in the bottle but a subtle rosy glow when applied on the apples of the cheeks or lips. If you apply in three lines horizontally across the apple of your cheeks and then rub it into the skin in circular motions the result should be a natural rosy glow. 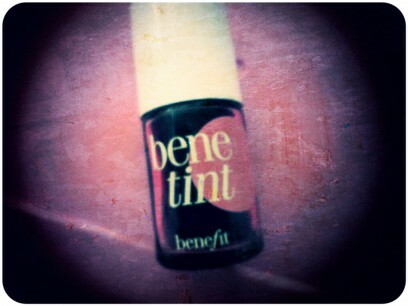 For a deeper glow add a few more dots of the Benetint where needed. I love the slight shimmer it gives but not so much as an obvious highlighter. Plus it’s great for nights out as it eliminates the need for blusher, blusher brush and lipstick. It claims to be kiss proof and water proof which is also handy to know incase your kissing in a swimming pool, you know you will be safe – it won’t come off! Fab product – a little bit pricey, but you only need a little bit at a time so one bottle lasts quite a while.